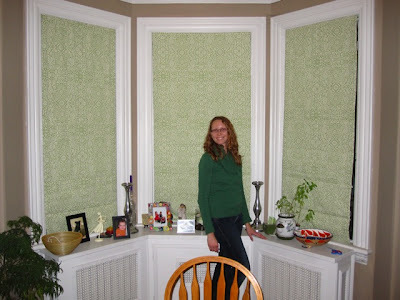 These curtains came with the house when we bought it two and a half years ago - 6 panels were hung on the livingroom windows. They're not bad curtains, but they made the room too dark for us. So, I chopped 2 panels up and installed them in Brian's office, here we see another two panels, and I'm considering recovering the rocking chair and stool with the other two panels. We'll see. The rocking chair was gifted to us by a very thoughtful coworker who no longer has wee little kids that need to be rocked, and the high chair was gifted to us by a supportive and excited friend Laura. Exactly what we were looking for! This is a bib from my dear friend Shannon (Auntie Shan, as she will be known) who has been living in Cairo for the past year and a half, and will continue to live there for at least another year and a half. She's having some great adventures, but we wish that she lived closer to us. This bib was cross stitched by the ladies of a Cairo Coptic Christian church for a bazaar earlier this year. How cool is this?! I love it! And here we have a little sweater set that was hand knitted with care and love by a very special woman in our church, "Grandma Margaret." Margaret is an absolutely wonderful woman who lost her husband in the past year(ish), and she takes great delight in mixing the different people and age groups at our church together at her house every Sunday afternoon for delicious dutch soup lunches. Margaret wanted very much to make something for our little one. We're really blessed to have her in our lives, especially since we have very few family members living in the direct area! And finally, this photo was taken last week, when we were 34 weeks along. Now we're almost at 35, and I can't believe it! Not much longer to go, now! Time flies! So, once upon a time (er - 1.5 years ago, to be precise), my friend Amanda asked if I would make some roman blinds for her large windows that her neighbors constantly peek into un-apologetically. I agreed, we went out and bought the material, and I got started. 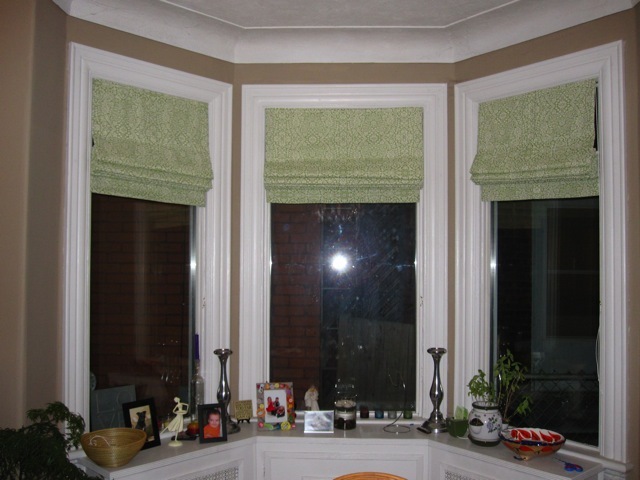 But, the last roman blinds that I made didn't really turn out so well - when they were pulled to the top, they went all bunchy and wrinkled, as opposed to having nice straight folds. So, like any good friend, I procrastinated. For a year and a half. But. This past weekend, I finally finished them. Here they are, hanging in the windows. I'm pretty proud of them, and I feel a little silly and a lot bad for taking so long to finish them! Don't they look nice?